The Audubon Park Psalter consists of five volumes: one for each of the liturgical years (A, B, and C), a fourth for Solemnities, Feasts and other holidays and a shorter fifth volume containing palms for weddings and funerals. It uses the new Revised Grail Psalm translation for the verses with the ICEL refrains. Each liturgical year volume is 60-70 pages and contain over 50 psalm settings. After several years of leading very eclectic music programs, I felt the need for a psalter that would raise the standard of music available and that could be adapted to many different settings. The Audubon Park Psalter is designed to be flexible instrumentally and vocally. The verses are written most often in a one pulse per measure chant style (like Gelineau) so that a consistent tempo may be kept between the refrain and the verses. Having chant style verses makes the singer’s task of learning multiple verses easier than a through-composed setting, but by keeping a pulse, it is possible to have much more interesting melodies than a common 3-5 note chant settings would offer. Because the verses are most often written in traditional four-part harmony, a choir could sing the text or accompany the cantor by singing on a neutral syllable. A string quartet or woodwind ensemble could also read the vocal lines for additional accompaniment colors. Because of the consistent rhythm, a skilled ensemble of piano, guitar and drums, could take many of these settings into different jazz or contemporary styles. Written with a harmonic language that is interesting, yet accessible, these settings are designed to be singable, playable and achievable for most any parish music program. Check out the playlist of recordings from live performances of the psalter. Scores may be purchased as a set or individually: Year A, Year B, Year C, Solemnities and Feasts, Weddings and Funerals. Today I received official approval from the Committee on Divine Worship of the United States Conference of Catholic Bishops to publish my settings of the Revised Grail Psalter with the ICEL refrains. The Audubon Park Psalter will consist of four volumes: one for each of the liturgical years (A, B, and C) and a fourth for Solemnities, Feasts and other holidays. Each volume will be 60-70 pages and contain over 50 psalm settings. After several years of leading very eclectic music programs, I felt the need for a psalter that could be adapted to many different settings. The Audubon Park Psalter is designed to be useable in the traditional organ and cantor setting, but also by the contemporary ensemble with piano, guitars, and even drums. Any attempts to find repertoire common to both groups, would usually lead to complaints from one or the other, so when creating these new settings, I endeavored to use a harmonic language that will be interesting to the highly trained musicians and yet accessible to those with less formation. The verses are written most often in a one pulse per measure chant style (like Gelineau) so that a drummer could play continuously through the psalm (instead of dropping out for non-metrical chanted verses). The verses are also written in traditional four-part harmony so that a choir could sing them (if desired). Having chant style verses makes the singer’s task of learning multiple verses easier than a through-composed setting, but by keeping a pulse, it is possible to have much more interesting melodies than a common 3-5 note chant settings would offer. These settings are designed to be singable, interesting and achievable for most any parish music program. Look for more information to come as I finalize the drafts for publication. 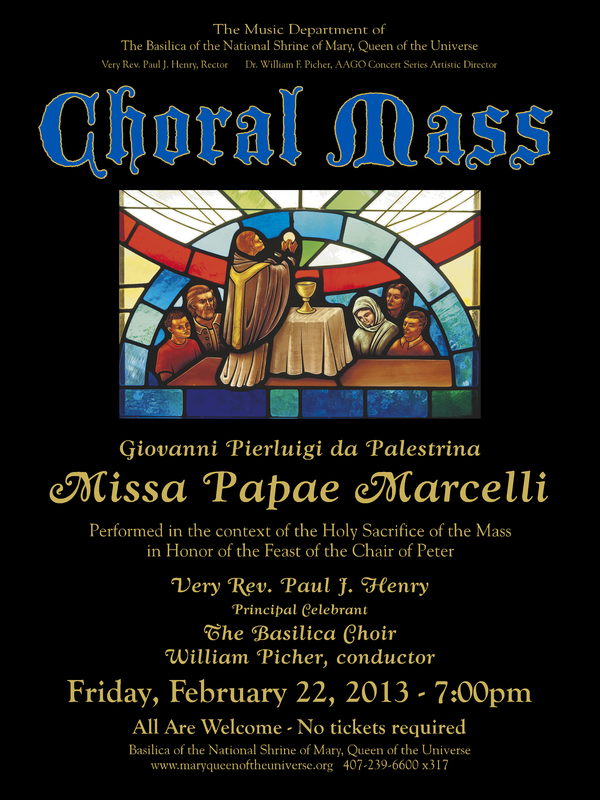 Experience Palestrina’s sublime a cappella choral masterpiece, “Missa Papae Marcelli” in the context of the Holy Sacrifice of the Mass. Also includes the premier of two new compositions in the style of Palestrina- a setting of Psalm 23 and Salvator Mundi– by Wm. Glenn Osborne who will serve as organist for the celebration. Bishop John Noonan will preside. The Basilica Choir under the direction of William Picher. While I was at the University of Notre Dame pursuing my Master’s degree, I served as organist at Gloria Dei Lutheran Church. Inspired by the stories of Johann Sebastian Bach writing a cantata every week, I took it as my own challenge to write a psalm setting every week while I was there. The choir and cantors there became my compositional laboratory, and I turned out probably 100 psalm settings during my two years there. I dropped this practice when I went to France to study, but resumed it again when I became music director at the Cathedral of the Immaculate Conception in Albany, NY. While I would have liked to reuse some of my settings from Indiana, unfortunately, most of the scores I did were minimal vocal only scores without notation for any keyboard part. Sometimes, I could figure out what I had intended to play at the keyboard, but other times, the music was effectively lost in time. In order to encourage congregational singing, many of my psalm settings written in Albany used phrases from hymn tunes to make the refrains readily accessible to the people. Please feel free to contact me if you would like to consider using my psalm settings at your local church. Psalm 146 – Praise the Lord! This psalm setting was commissioned by Elsa Heckman for the music ministry of Our Lady of Grace in Palm Bay, FL on the occasion of the 20th anniversary of the parish. In discussing with Elsa that kind of composition she wanted for the event, we decided that an upbeat Gospel style setting would be most appealing for the occasion and the congregation. The two recordings below are from a live performances at Holy Cross in Orlando in 2011. I don’t think I could be more happy with how the performance turned out. Sarah Whittemore, the Basilica Choir, and orchestra all did a wonderful job with the psalm! Listen to the live performance below to hear for yourself. Read about how this piece came to be here. 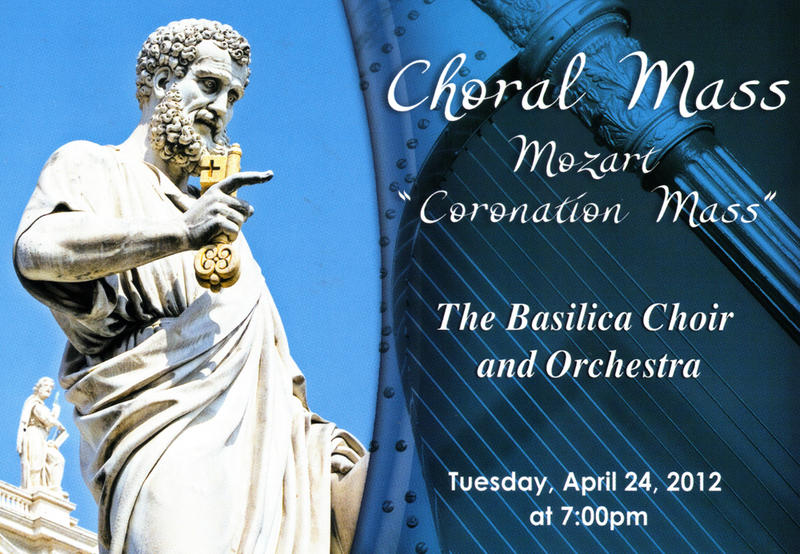 For the Mozart Coronation Mass at the Basilica of the National Shrine of Mary, Queen of the Universe, Dr. William Picher asked if I’d like to collaborate on the musical setting of the psalm to be used at Mass that evening. Since most of the music for Mass is by Mozart, he had found a phrase from a Mozart string quintet to use as the refrain and asked if I’d write music for the verses. Bill has used several of my psalm settings previously, so was looking for a simple tone much like those I’ve sent him previously. After having a look at the last movement of K. 516 that Bill used for the refrain, I found a portion of the string quintet that lent itself as a nice chord progression for the psalm verses. Knowing that there would at least be strings available, it made sense to me to create an entire orchestration for the composition. A recording of the live performance is now available here.